I’m in the middle of booking a holiday to Sicily at the moment. Naturally I want to get cheap Eurostar tickets for the first bit of the journey. The journey will go from London to Paris then Paris to Milan, Milan to Naples and Naples to Palermo – as discovered initially with the help of Loco2’s excellent Engine Room, where the team will answer questions about train journeys all over the place, with a wealth of knowledge and information. I’ve got an InterRail pass, courtesy of Rail Europe which will cover many of the local trains in France and Italy – but for the high speed trains and overnight trains, bookings will have to be made at a reduced pass holder rate. This is fine by me, as it’s still pretty cheap this way – the most expensive train will be the sleeper from Naples to Palermo and that’s only £29 with a youth global pass. Frustration only entered the booking process when – as I was trying to work out which trains needed to be reserved in Europe – the Eurostar fare from London to Paris went up in front of my eyes, from £38 to £56. This was a blow because the price of the train fare was edging closer to the price of the EasyJet flight from London to Palermo. And I didn’t want that. I wanted trains to win. On looking up the price of the flight I was happy to discover that even with the increase in the Eurostar fare, it would still be about £80 more expensive to fly. But I was still distressed by the fare increase. So I tweeted about it. At that point my lovely friends at International Rail, asked if I’d like them to search the fares and reservations I’d need, as well as finding the best available Eurostar fare. I was filled with feelings of warmth towards them, and said yes. Not only did they find all the trains I’d need to book in Europe, BUT told me they could hold the Eurostar fare at £53. And they could hold it for a week. So even if the fares went up mine would not. While I’d always advocate booking as far in advance as possible (see my post on the Caledonian Sleeper) this is a great option when you need a few hours, or days, to sort out other bookings. And so, in the future – when I see a great Eurostar fare I’m not quite ready to book – I’ll be straight on Skype to International Rail asking them to hold the cheap fare for me. And then I will win. And you can win too. The prices you see with Eurostar are calculated on the basis that all reserved seats on the train will actually be taken, but obviously only a certain percentage of their held seats will ultimately be used. Other customers querying prices for the same trains will see higher prices as if all the seats had already been sold. Day 2: Query price again. “Aargh it’s going up in price, this is annoying but it’ll only get more expensive so I better go for it!” Book the ticket. Day 2: Sophie and 10 others say to International Rail and equivalents, “Oh well, turns out I don’t need this reservation after all, thanks anyway”. Reservations released. Day 3: Query price again to feel reassured about taking the decision to make the booking the day before. “Wtf?! It’s CHEAPER! I hate EVERYONE”. With the above example in mind, it could be seen as a bit unfair that there is no cost for the person holding the reservation given that they could be pushing prices up unnecessarily for other customers. Generally speaking, I am a big advocate of there being one slick booking infrastructure that works the same for online and offline travel agents. The fact that customers using the offline/phone method are able to hold reservations, but internet users are not, seems a little wrong. Another option could be that the customer placing the reservation is charged a small deposit which is non-refundable in the case that the ticket is not used – that could then be used to subsidise the other remaining tickets and stop the prices being pushed up so much. One thing’s for sure – it’s not easy! Ha! Gosh, well this is a bit like the Greek banks conundrum – if I want my money to stay in the banks so we’re all safe I should leave it there, but if I’m too fearful about collapse and starving to death while surrounded by zombies who have emerged due to country lockdown, I should take it out. In this case, if I want to help my fellow bookers see cheap fares I shouldn’t hold them, but if I want the cheap fares to ultimately be mine I should, because I can’t stop others holding fares and I know that they will continue to do so. Perhaps the answer is to hold and then when ready to book, check the fares haven’t gone back down again at time of actual booking. Then after that, walk away from the computer and never again check to see if the fares get any cheaper. But I think it’s great that you have some possible solutions, and perhaps they would work. I wouldn’t mind paying a small hold fee – particularly as the fare International Rail could see was £3 cheaper than what I could see. Interesting discussion here. Does this mean that the ticket touts can move into Eurostar tickets and drive up the prices. I sincerely hope not! 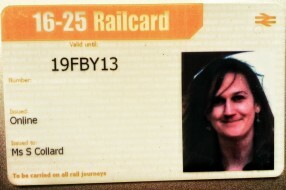 I have not yet seen a train ticket tout – but it would certainly make for temporarily hilarious viewing. Before they got dragged off by security.